Mel's transformation took "15 minutes". YOU always suspected those before-and-after fitness photos were bunkum, right? Well, at least one personal trainer agrees with you. 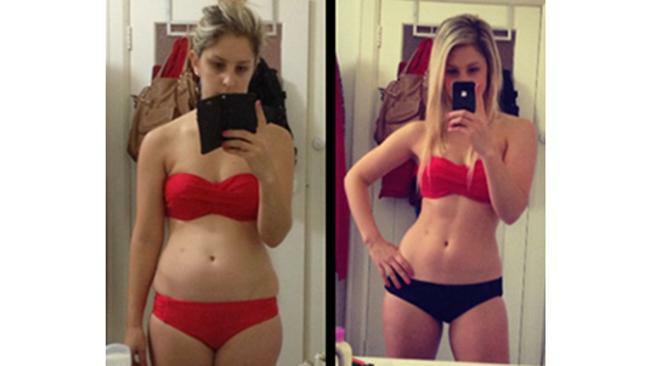 She's taken to Instagram to expose "the hidden truths behind a transformation pic". This mock before-and-after image has been doing the rounds online since it was posted by Mel, a personal trainer in Melbourne and the owner of MelVFitness . The photo on the left was snapped just 15 minutes before the one on the right. "Firstly I ditched the phonewallet cause that s**t is lame, swapped my bather bottoms to blacks (cause they're a size bigger and black is slimming), smothered on some fake tan, clipped in my hair extensions, stood up a bit taller, sucked in my guts, popped my hip, threw in a skinny arm, stood a bit wider, pulled my shoulders back and added a bit of a cheeky I'm so proud of my results smile. Zoomed in on the before pic - zoomed out on the after and added a filter." That's it. No secret weight loss formula. Not even any exercise. "What's my point? Don't be deceived by what you see in magazines and on Instagram. "You never see the dozens of other pics they took that weren't as flattering. Photoshop can make a pig look hotter than Beyonce." We'd like to test that last hypothesis. Maybe later. Mel said before-and-after shots give people "unrealistic expectations" about weight loss and muscle gain. "What a before and after shot doesn't tell you is how the person achieved it," she said. "It doesn't tell you if they did it a healthy way or if they starved themselves for weeks on end to get there. "Transformations take time, and good lighting can make buddah have a six pack." The upshot? Stop feeling insecure when you see before-and-after photos, because they're about as trustworthy as a politician in the last week of an election campaign.